Lim Seng was a struggling restauranteur in the 1960s when he dove into the heroin business. He wasn’t struggling much longer. The other 10% helped feed a burgeoning heroin addiction among Manila students, leading to a seminal 1972 anti-drug law under which Lim Seng was arrested days after martial law came down that September. He faced a military, rather than a civilian trial. Naturally quite wealthy from his enterprise, he evidently believed up until the last moments that he could buy his way out of execution. Little did he understand that he had been ticketed to demonstrate the incipient dictatorship’s iron fist: thousands of civilian spectators crowded the ropeline of the rifle range to glimpse the garishly publicized ceremony, while others took in the radio broadcast or news footage. Lim Seng was the first person executed by the Marcos regime for drug trafficking. * Lim Seng was tried in December 1972, and some sources report this as his execution date. 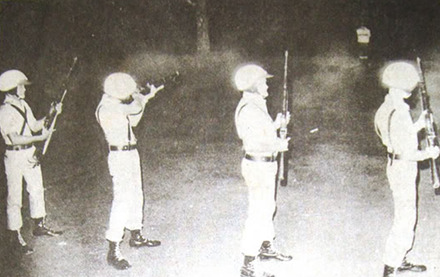 Contemporary newspaper accounts unambiguously confirm that the execution took place on January 15, 1973. ** Fort Andres Bonifacio, formerly a base of the U.S. occupation called Fort McKinley, was christened for an executed Filipino patriot. I was a seaman, in Manila on vacation back then. A friend of mine went to watch the event. I declined accompanying him as it was too early in the morning, 06:00. This was one of the events in history that is used to set an example of how fast it took for the Philippine government at that time to take action on criminal activity. Harm the country at a high level, face the consequence. Of course times have changed. I was an eight year old when Lim Seng’s execution by firing squad was shown in the evening news in Philippine television. I can only remember the video clip as being dark as we only had black-and-white television then and the execution took place when it was still dark. I just remember a human being tied to a stake who I presumed was Lim Seng. Again, another indelible part of my childhood in martial law Philippines.